Johnny Manziel is back at it again. The 25-year-old former NFL quarterback, who is two-years removed from the league, was invited by college receivers to throw to them at the University of San Diego on Thursday. 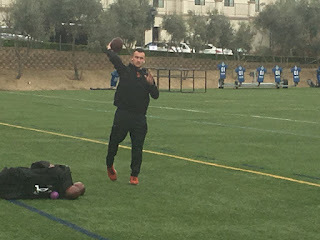 Manziel’s practice session with receiver, Justin Priest, and tight end, Ross Dwelley, brought about a lot of buzz, as 13 NFL teams were on hand to observe – including Jonathan Howard, area scout for the the New England Patriots. While highly unlikely, it’s not impossible that Manziel could join forces with Bill Belichick and Tom Brady one day. Granted there are a ton of risks for this to happen, no one really ever knows the next moves that Belichick has up his sleeve. Belichick has said before that when a team brings on a player, it gets everything that comes with him – on and off the field. But that didn’t stop the Patriots from bringing on Tim Tebow for a short time in 2016, and we know he brought along a lot of attention. Belichick also likes to think outside the box and bring up unknown players to eventually turn them into strong threats for the team. While he may appreciate Manziel’s newfound work ethic and unique traits, it’s more likely that the team sticks with no third quarterback option or opts to look into this year’s draft class. All in all, Manziel to the Patriots is probably out, but then again, who really knows what Belichick will do next?